How would you describe the characteristic of gentleness? How does the fruit of gentleness grow in your life? Sometimes the world feels so big and overwhelming that you wonder where you fit and what difference you can make. My hearts hurts for all the needs that I see each day, often I feel at a loss for what one person can do to make a different in a world that is tattered and torn. I saw the quote above as I scrolled through my Pinterest feed one day - It stayed with me and I kept thinking about it. I am the type of person who has all the big ideas. My mind creates all these grandiose ideas and plans. I get excited, then I get others excited and sometimes the plans happen and sometimes they don't. But you know what I have learned? I do not need to be the big booming voice, I can be me and I can make a difference in this world. God uses the willing. Once I understood this and started to do something about it - I noticed that my daughters started to talk about what they can do as well. What an encouragement to my heart. All it takes is one person to start in a positive motion and it will affect others. Have you ever felt so small that you could never have an impact? Do you believe with your whole being that God needs you to be His hands and feet in the place that you live? How can you choose to live this week with a gentle and quiet spirit and be the hands and feet of Christ? Show me the path,where I should walk, O Lord; point out the right road for me to follow. Lead me by your truth and teach me for you are the God who saves me. All day long I put my hope in you. Remember, O Lord, your unfailing love and compassion, which you have shown from the long ages past. Forgive the rebellious sins of my youth, look instead through the eyes of your unfailing love, for you are merciful, O Lord. He leads the humble in what is right, teaching them his way. 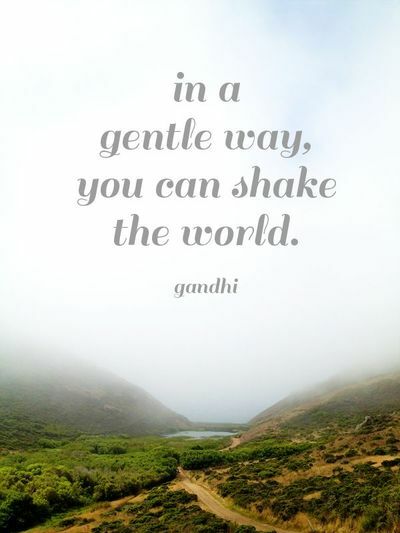 What I have learned over the past weeks is that Gentleness is power. That if we allow this fruit to grow, develop and be pruned in our lives that a power that we have ever known will manifest in our lives. We are to be meek ( yielded, teachable, responsive ) first of all in our relationship with God, and secondly meek (humble, gentle, respectful ) in our relationships with people. To become this kind of person, God must thin and prune us! The words that David penned in Psalms 25 jumped off the page at me. As we put our hope in Him, His path unfolds before us. Are you willing to let go? Study the passage in Psalms 25. What jumps out to you? Do you feel that as you come before the Lord in prayer that you are yielded, teachable and responsive? Spend time in prayer seeking the path of gentleness in your life.